Hadsar town has two distinct seasons, the pilgrimage season and the other season. During the pilgrimage season, a host of hotels, restaurants and shops spring up in town. It's only a month after the Mani Mahesh pilgrimage that the town settles back to normal; the town slips back to its couple of tea shops and three times a day HRTC bus connection to Bharmour. A well-marked mule trail connects Hadsar with Mani Mahesh. The trail starts near the Buddhil nullah and Mani Mahesh nullah intersection. A large gate and a couple of temples mark the starting point for this trail. The first kilometre is a modest climb through a wood. After the first kilometre, the trail zig-zags towards the first Mani Mahesh stream crossing. Dhancho (6 kilometres from Hadsar) is one kilometre from this stream crossing. From Dhancho there is a steep climb till Sundrasi. Sundrasi hosts a tea shop during the pilgrimage. From Sundrasi there are two routes you can take. 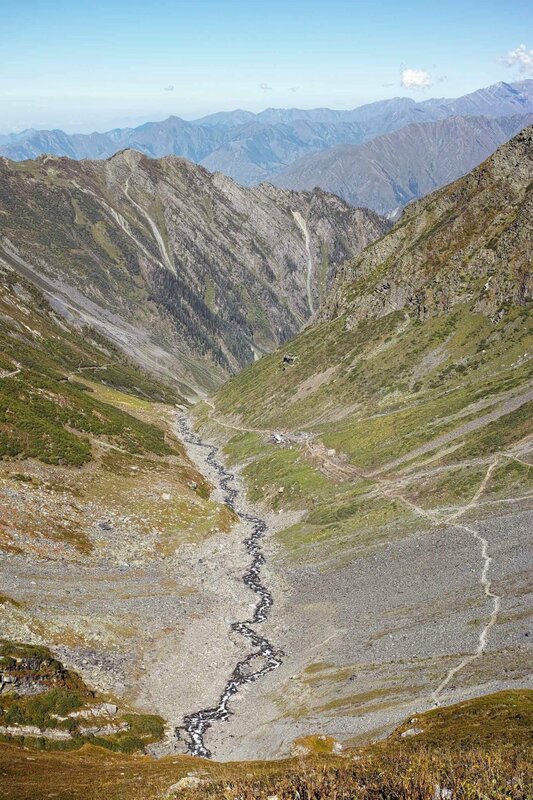 The first and the easier choice is an enormous zig zag over a moraine straight on to Gaurikund. The other and the more difficult route reaches Gaurikund via "Bhairav Ghati". Sundrasi (the white tops) in the middle of the photo. The "Bairav Ghati" bifurcation is visible. Immediately after Gaurikund, you cross the Mani Mahesh nullah the second time, only this time over a metal girder bridge. The gradient eases out after Gaurikund and Mani Mahesh lake is 1.5 kilometres from Gaurikund. Gaurikund and Mani Mahesh Helipad (the white concrete square) visible. Hadsar to Mani Mahesh can be completed in one day. However, the elevation gain from Hadsar to ManiMahesh is 2,182 metres. If you're not acclimatised, we recommend an overnight halt at Dhancho (2,967m elevation). Read about my trek experience. Hadsar - 12 kilometres, 30 minutes from Bharmour, H.P. View in Google Maps. Hadsar is connected by bus with Bharmour. Daily buses ply between Bharmour and Hadsar. The last HRTC bus leaves Hadsar for Bharmour at 1530 hours. Lots of private vehicles, shared taxis and jeeps ply this road and you can hitchhike if you miss the bus. Two tea shops are open through the fair weather season (June to November) on the Mani Mahesh trail. Raju's tea shop at Dhancho and the tea shop at Mani Mahesh Lake. These shops will provide you with food and overnight stay. Beds, blankets and basic food are available. The usual lodging charges are Rs. 100-150/day at Dhancho and Mani Mahesh. The other shops cannot be relied upon to be open a month before and after the pilgrimage. Hadsar has a few hotels and locals will happily rent you a bed and food for reasonable prices during the non-pilgrimage season. Bharmour is the nearest large town and has a wider selection of hotels ranging from economy to luxury. Notoriously fickle weather at Mani Mahesh. This area is notorious for weather extremes and inclement weather is not to be taken lightly. Hadsar has mobile phone connectivity, yet the data connectivity is 2G (as of 2016). Airtel and BSNL will work at Hadsar. BSNL also has spotty and unreliable coverage at Gaurikund. Elevation Profile (what is this?) for Hadsar-Mani Mahesh Trek route. Chamba Kailash reflected in Mani Mahesh lake.